These delicate spring rolls are filled with shredded pork, shrimp, black mushrooms, and garlic chives. Soften the mushrooms by soaking in hot water for 20 to 30 minutes. Squeeze out any excess water. Cut off the stems and slice finely. Cut the pork into matchsticks. Add the soy sauce, sesame oil, and cornstarch. Marinate for 15 minutes. Rinse the shrimp under warm running water. Pat dry with paper towels. Chop finely. Toss with the rice wine and cornstarch. Marinate for 15 minutes. Rinse the mung bean sprouts and drain thoroughly. Wash the red bell pepper and dice. Wash and dice the garlic chives. Wash and shred the carrots and cabbage. In a small bowl, mix together the sauce ingredients. Set aside. Heat the wok over medium-high to high heat. When the oil is hot, add 2 tablespoons oil. When the oil is hot, add the garlic and stir-fry until aromatic. Add the pork. Stir-fry until it turns white and is about 80 percent cooked through. Remove from the wok and drain on paper towels. Add 2 tablespoons oil. When the oil is hot, add the ginger. Stir-fry until aromatic. Add the shrimp. Stir-fry until they turn pink. Remove from the wok and drain. Add 2 tablespoons oil. When the oil is hot, add the vegetables, one at a time, beginning with the mushrooms, then the red bell pepper, cabbage, garlic chives, shredded carrot and mung bean sprouts. Add the sauce to the wok. Add the pork and shrimp back into the pan. Heat through. Remove and cool. Clean out the wok. Preheat the oil for deep-frying to 360 degrees Fahrenheit while preparing the spring rolls. Lay a spring roll wrapper in front of you so that it forms a diamond shape. Use your index finger to wet all the edges with water or a cornstarch/water paste. Place approximately 2 tablespoons of filling near the bottom. Roll over once, tuck in the sides and then continue rolling. Seal the top. Deep-fry the spring rolls in 3 to 4 batches, cooking until they are golden brown and crispy (about 3 minutes). Remove with a slotted spoon and drain on paper towels. 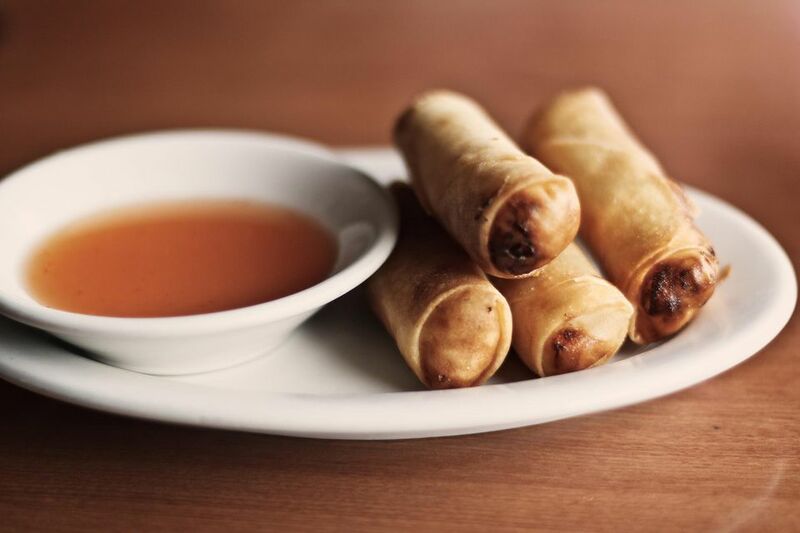 Serve the spring rolls with the plum sauce and hot mustard for dipping. Vietnamese Spring Rolls - Cha Gio - served with sweet and sour fish sauce for dipping.